Greenbrae homes share a prime location in Central Marin with Corte Madera homes. For commuters, Greenbrae, Larkspur, and Corte Madera are close to Highway 101 for an easy commute to San Francisco, nearby the Larkspur Ferry Terminal, and close to the Richmond-San Rafael Bridge to the East Bay. 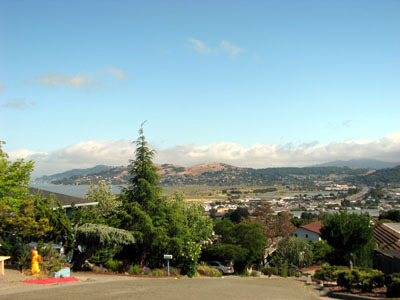 Much of Greenbrae real estate enjoys panoramic views of the Mt. Tamalpais and the Bay. Sir Frances Drake Blvd, the major east-west route through Marin, divides Greenbrae into to parts. To the north, Greenbrae climbs a steep hill with winding streets, providing views of Mount Tamalpais and the Bay. Concentrated to the south, between Sir Frances Drake Blvd and the Corte Madera Creek, are many condos, townhouses, and apartments. Many have fine views and creek-side locations. Sir Frances Drake originates near the Richmond-San Rafael Bridge and moves westward through Larkspur Landing, Greenbrae, Kentfield, Ross, San Anselmo, Fairfax, then into West Marin, terminating at the lighthouse in the Point Reyes National Seashore. The road is named for the English explorer Francis Drake, who landed along the Pacific coast in 1579, claiming the area for England. Drake’s landing place is uncertain but it may have been along Drakes Bay, in the long southern sweep of Point Reyes National Seashore. 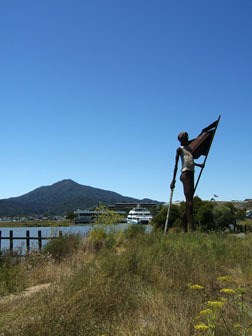 Others claim that Drake came into San Francisco Bay and landed near Larkspur Landing, marked by a large steel sculpture of the famous explorer. Greenbrae is anchored by two important facilities, the Bon Air Shopping Center and Marin General Hospital. The shopping center, extensively updated in 2016-17, provides a wide variety of conveniences including a super market, restaurants, clothing stores, and gas stations. Nearby in Marin General Hospital, the largest publicly owned and supported hospital in Marin, and a large number of surrounding medical offices. The hospital is undergoing a major renovation and expansion in 2016-17.